I have admitted to a lot of things on this website. I have admitted the debauchery and corruption of my Mughal ancestors. I have admitted to being a non-neo-Con medium-sized-C conservative. I have acknowledged watching movies about Indian prostitutes. I have even acknowledged having a spiritual connection with bikies. Today, dear readers, I acknowledge that my parents chose to send me to an Anglican Cathedral School. For 8 years, I was a proud student of Sydney’s only Anglican Cathedral School. Whilst my relatives languished at Trinity Grammar and Newington College, I can say that I wore a safari suit and a boater at St. Andrews Cathedral School. Each week I would go to chapel services in the Cathedral. Each week we would have one hour of divinity. I could have been exempt, but my folks forced me to go. I read the Good News Bible, the Revised Standard Version (both 1952 and 1971 versions) and came close to having myself baptized in Year 6. St. Andrews was a boys-only school (it was not until years after I left that the school felt secure enough to introduce limited co-educational classes in senior years) with a strong low-church evangelical Anglican tradition. It also had a world famous choir. My voice was good enough for me to become the first Muslim chorister in the St. Andrews choir. My parents refused my requests. Was it religious objections? Was it a fear that I might get baptized? Was it fear that my soul would be damned by singing hymns in praise of the holy trinity? Thumhara parhayi pe bohot zyada asar parega! Anyway, it was at St. Andrews that I discovered another kind of music. It was the powerful sounds, passionate lyrics and atrocious dancing of Peter Garrett and his band Midnight Oil. Their hit single “Power and the Passion” became an anthem for the hard-rocking St. Andrews lads. And the school never discouraged us given the strong Christian streak in Garrett’s music. The only problem I had at St. Andrews was the image I had of Christ himself. I was prepared to accept that he may have died for my sins. I was happy to acknowledge that he may have risen from the dead. But how could this Middle Easterner be portrayed as having blue eyes and light brown hair? I had a Lebanese Christian friend at school who hard dark brown hair and black eyes. I asked him about it, and he too was a bit confused. Gibson strips Christ of all the Western mythical and cultural baggage to reveal a man who has more in common with someone being bashed by an Israeli soldier than with the soldier. Christ’s female companions are shown as having more in common with the Palestinian girls in Hebron being harassed by Jewish settlers than with the Jewish settlers themselves. And what language does Christ speak? Is it American English? Is it modern Europeanized Israeli Hebrew? No. It is Aramaic, a cognate language of Arabic (and ancient Hebrew) still spoken in parts of Iraq and Syria by the Assyrian Christians. In fact, all their services are in Aramaic, and their church music and hymns are in Aramaic. A far cry from St. Andrews choir! And what has been the reaction? Well, some people are scared that we are all going to start hating Jews as much as some Jews would like us to hate Arabs and Muslims. Some people are scared that Mel Gibson has become Catholicism’s answer to Daniel Pipes, someone determined to spread innuendo and lies in an effort to demonize a whole community. After years of Hollywood portraying Arabs as demons and devils, you can imagine how upset these image-makers might feel to see their investment going to waste now that Christ himself walks and dresses like an Arab, speaks a dialect of Arabic and has a beard--not to mention that his mom and female companions are seen wearing a piece of cloth many Western politicians would like to see banned. 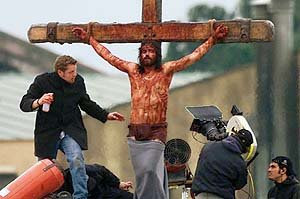 This is not the Christ which some people want Western Christians to see. Further, some Jewish organization representatives are upset with the movie for undermining their position denying any Jewish role in the plot to kill Christ. So just what religion were the Sanhedrin of the time following? Were they Parsees? And the crowds that jeered and watched the entire scene of people carrying their crosses up Golgotha. Were they Druids? Or did Jerusalem become Hindu for a day? According to the New Testament, Jewish authorities of the time were involved in the plot to murder Christ. Muslim tradition even quotes Medinan rabbis boasting to the Prophet Muhammad that they (the Jews) killed the Muslim Messiah. Even if the Jewish authorities at the time were involved, does that justify the atrocities committed against Jews throughout the Dark & Middle Ages? Or the Atrocities committed by the Nazis? Of course not. Many religious communities have spiritual ancestors with blood on their hands. So do many ethnic, political and other communities. How many Jews and Muslims did the Spaniards and Portuguese kill as part of the Inquisition? How many Sikhs were killed by Aurangzeb’s mob? How many Hindus were slaughtered by Mahmud Ghaznavi’s armies? Does that mean the Spanish should deny the Inquisition ever happened in case they suffer an invasion by Arab League countries? Does that mean BJP mobs were justified in slaughtering Muslims in Gujarat? Denying history will not make any difference to the occurrence of hate-crimes. There will always be Christians who never forgive Jews, Jews who never forgive Christians, Hindus who never forgive Muslims, Muslims who never forgive Sikhs. And a God who will be happy to forgive the lot of them if they just stopped fighting and tried to get along! How Should Real Conservatives React? This movie can be a source of mutual understanding between Muslims and Christians. Muslims believe that Christ, like so many of God’s Prophets, suffered at the hands of his own people. Neocons (or rather, pseudo-Cons) may want war between the Christian and Muslim worlds. But such a conflict between two sets of Christ’s followers would be a disaster for world peace. Any step we take to bringing our two worlds together and foiling the neocons’ divisive attempts will be good for world peace. That means we need to actively defend Mel Gibson’s right to use his chosen medium (film) to express his religious beliefs. In the battle between the power of the neocons and the passion of Mel Gibson, we need to put our weight behind the spiritual passion of one believing man. Sensible Muslims should not be afraid to have some involvement in this debate. They welcome the film’s portrayal of Christ as a speaker of Aramaic and as someone who followed a culture still practiced throughout the Arab world. Sensible Christians should see the movie as an opportunity to learn more about the culture that Christ followed. They should also understand how Christians in that part of the world continue to suffer. Sensible Jews should tell their community spokespeople to just shut up and siddown. By protesting the movie's basic Christian message, they are undermining the whole concept of a 'judeo-christian' culture. Then again, is that really a bad thing? As for me, I will react to the movie by going and seeing it a second time. See you all at the Belco cinemas!